The Script Player is used to playback recorded scripts. 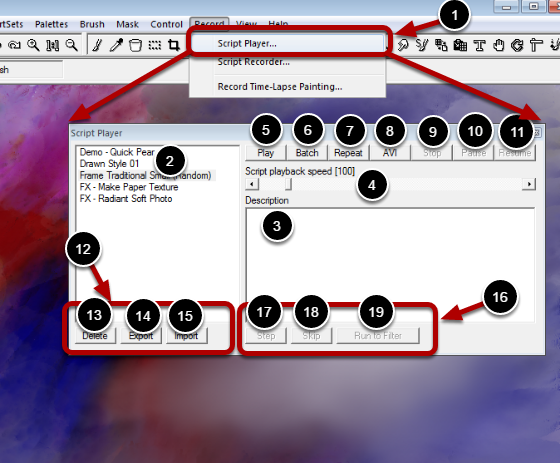 Select the Script Player item from the Record menu to show the Script Player panel. The list of available scripts are show here. When you select a script the description, if available, is shown here. Scripts can be played back at different speeds. This can be set prior to the start of the script as well as during playback. With this slider it is also possible to start a script paused. Starting a script paused is useful when stepping through the script one command at a time with the Step button. The Play button is the normal way to playback a script on the currently load image. The Batch button will launch the Batch Processing dialog to apply the script to multiple image files. See the Batch Processing topic for more details. The Repeat button will play the script endlessly until the Stop button is pressed. The AVI button will playback a script file to an video file that you can share with others. The Stop button ends the execution of a running script. The Pause button pauses a running script. The Resume button resumes the execution of a paused script. These buttons are used to manage the list of scripts. The Delete button will delete the selected script. The Export button allows saving the selected script to a different location in the file system. The Import button is used to pull a script form a different location into the default script list. One example of this is to import a script form the Solutions folders so that is can be played back from the Script Player. These buttons are used to manually step through a paused script. The can be useful to change part of a script that is playing back or insert new actions into a script. The Step button will execute one command from the paused script. The Skip button will skip the next command in the paused script. The Run to Filter will execute the script until the next filter is encountered.